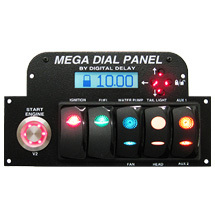 The Elite Mega Panel Switch Panel brings you the same performance and reliability of our Mega Panel with the addition of our NEW Elite Relay Board! The sleek and compact Switch Panel is the main part of the system and includes 6 labeled switches to control your car’s most important functions. The unique starter button and premium grade switches combine a new age design with functionality. 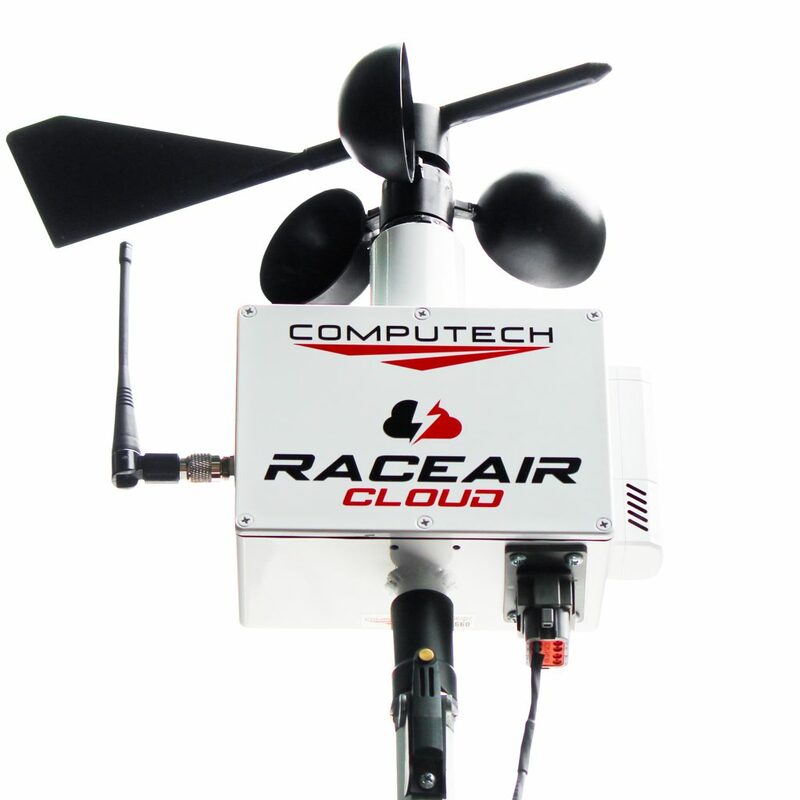 The ignition and fuel pump switches are dual position switches while the Fan/Water Pump, Head light/Tail light, and Aux 1/Aux 2 are all three position switches. It is made to easily fit into a dragster’s dash (door car/roadster mounting kits soon to come) with the overall size similar to the overall size of the conventional switch panel. 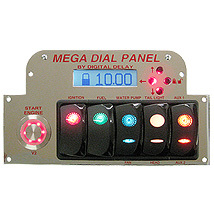 To simplify the wiring process, the Switch Panel plugs into our Elite Relay Board using the supplied heavy duty cable. 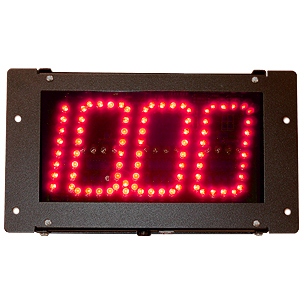 The Elite Relay Board is the “power distribution board” and was built with durability in mind. 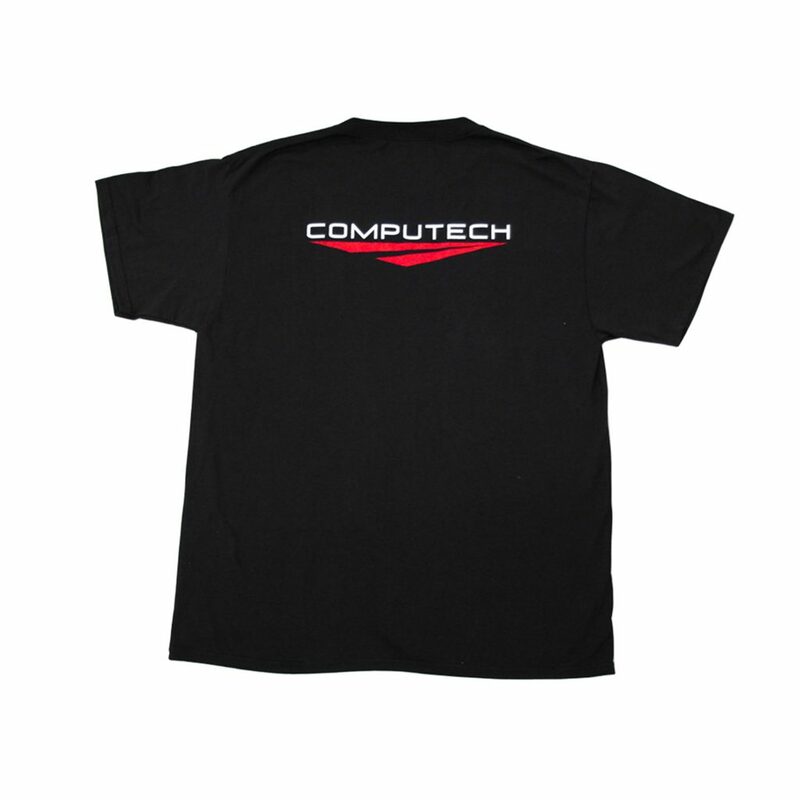 It is capable of handling a 100amp load with the supplied 6 gauge wire that connects from the high current connector on the Board to the master cut off switch. It also includes dedicated relays for each switch, with each relay including its own status indicator light to let you know which circuit is on, and a dedicated fuse assigned to it. The Elite Relay Power Board has a Shift Output Controller that is only active when the Ignition switch is on. The Shift Output Controller allows the driver to select whether to shift on time or RPM using a remotely mounted Select Switch (usually mounted on the dash). The Elite Relay Board also has three slide switches. An Output Control Switch to control whether the shift output will apply +12 volts (N.O.) to shift or remove +12 Volts (N.C.) to shift and two Input Selector Switches used to tell the Elite Relay Board whether +12 Volts or ground is coming from the Shift Controllers. 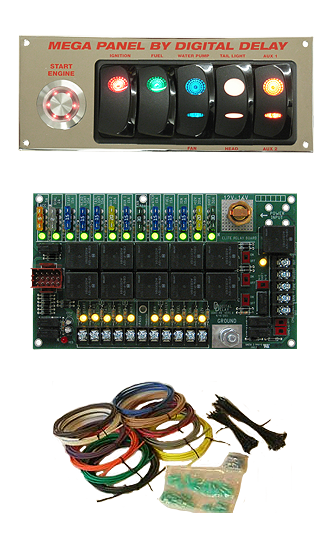 The relay board also includes the “Dual Select” feature which allows you to individually customize how to control each of the three position switches. For example; the switch on the Mega Panel Labeled FAN / Water Pump turns on the fan and water pump in one position and the water pump in the other position. By turning on the Dual Select dip switch located on the relay board, you can change it so that the fan only is on in the fan position and the water pump only is on in the other position. 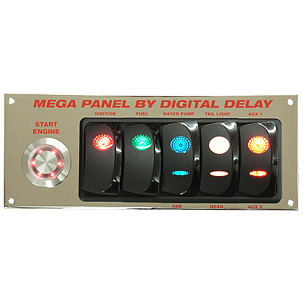 The Elite Mega Panel Chrome Switch Panel brings you the same performance and reliability of our Mega Panel with the addition of our NEW Elite Relay Board! 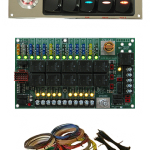 The sleek and compact Switch Panel is the main part of the system and includes 6 labeled switches to control your car’s most important functions. The unique starter button and premium grade switches combine a new age design with functionality. 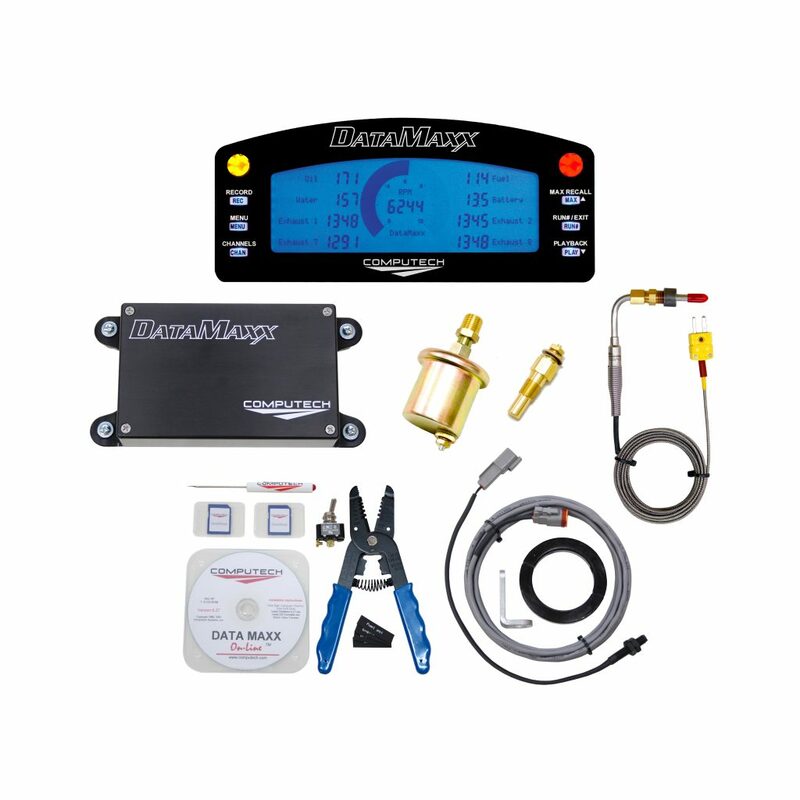 The ignition and fuel pump switches are dual position switches while the Fan/Water Pump, Head light/Tail light, and Aux 1/Aux 2 are all three position switches. It is made to easily fit into a dragsters dash (door car/roadster mounting kits soon to come) with the overall size similar to the overall size of the conventional switch panel.